The Wake Up Project: United Nations False-Flag Terror Attack Planned For New York City? United Nations False-Flag Terror Attack Planned For New York City? SWITZERLAND, Zurich — Potentially the most high profile UN meeting ever was scheduled for September 26, 2012, in New York City. The meeting date also falls on Yom Kippur which completes the annual period known in Judaism as the Yamim Nora’im or “Days of Awe”. The World Headquarters of the United Nations is scheduled to host the leaders of Israel and Iran and U.S. President Obama. In addition, German Chancellor Angela Merkel, French President Francois Hollande and U.K. Prime Minister David Cameron are also scheduled to attend the U.N. forum. According to reports, Iranian President Ahmadinejad and Palestinian President Mahmoud Abbas have allegedly threatened to use the 2012 General Assembly to advance the campaign for Palestinian unilateral statehood. 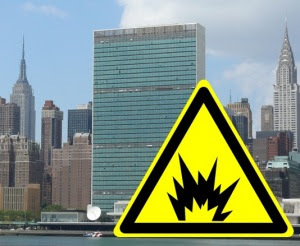 Given the current geopolitical climate, there is a real possibility that the United Nations’ World Headquarters in New York City, which is currently “under construction”, may be the site of a major false-flag terror attack. The motives for a UN terror attack would be multifaceted in that it would garner support for Obama at home, potentially create a reason to suspend the 2012 U.S. presidential election, create unprecedented racial and religious turmoil in the Middle East and give the United Nations a reason to move their World Headquarters to Geneva, Switzerland. Based on its location, convenient construction and terror drills, a high profile 9/11 style attack (plane into building, building comes down) on the UN building may be planned. The unprecedented UN meeting comes in the wake of the U.S. embassy attack in Libya, which has recently been alleged to have been a CIA/Mossad operation. Also, a Joint Intelligence Bulletin issued by the FBI and the U.S. Department of Homeland Security has warned that the violent outrage aimed at U.S. embassies spawned by the movie mocking the Prophet Mohammed could spread to America by extremist groups eager to “exploit anger” and that “the risk of violence could increase both at home and abroad as the film continues to gain attention.” On top of that, a French satirical magazine has published controversial caricatures of the Prophet Mohammed stating that the illustrations would “shock those who will want to be shocked”. It appears that a global operation to rile up Islamic hatred towards the West is being executed with the potential goal of providing cover for an impending terror attack on the West. Occurring exactly at the same time as the UN meeting is the largest Western naval exercise ever held in the Middle East. The military exercise which allegedly focuses on countering the threat of Iranian anti-ship mines is unprecedented in scope and includes the U.K., France, Japan, Jordan and New Zealand for a total of more than 30 countries. The massive war drill officially started on September 16, 2012 and lasts through September 27, 2012. Coincidentally, Iran is holding a massive air defense drill in October which incorporates Iranian aerial and ground forces, the army’s air defense systems, as well as Iranian air force fighter jets and the Iranian Revolutionary Guard Corps. On April 3, 2012, it was reported that an Al Qaeda website published a glitzy graphic promising that Al Qaeda would be “coming soon again” to New York, New York. Set against a Manhattan skyline at sunset, the graphic stated, “Al Qaeda – Coming Soon Again in New York”. According to the report, the message initially appeared on a website classified by the NYPD as a Category 1 website, meaning one heavily used by “jihadis”. A representative of one of the forums published a message allegedly stating, “Allah-willing, [terrorists] will return soon stronger and a bigger thorn in the throats of the enemies and tyrants”. On multiple occasions, Iranian President Mahmoud Ahmadinejad has been blatantly disrespected by Israeli, American and European politicians, dignitaries and ambassadors when they stood up and walked out of his speech to the United Nations’ general assembly. Although Ahmadinejad didn’t seem to mind the distraction, the individuals which left cited Ahmadinejad’s rhetoric in respect to Zionism, Israel’s genocidal policy towards Palestine and the truth behind 9/11 as the justification for their rude behavior. Should a terror attack strike the United Nations it is possible that Iran will be blamed and Ahmadinejad will be scapegoated as wanting revenge for previously being so publicly disrespected. Even before Palestine could present their bid for official statehood, predictions that Palestinians would turn violent began to circulate. Committing acts of terror prior to a U.N. vote is counterproductive and is obviously not in the best interest of Palestine. This type of propaganda only makes sense when it is understood that Israel is in fact the occupying and terrorizing force in Gaza. Israel is violently opposed to a Palestinian state and will do anything and everything in its power to destroy any notion of Palestinian statehood. If and when Palestine is rejected for statehood by the U.N., the rejection could easily serve as an alleged motive for a future terror attack on the U.N. itself. .Palestine is Israel’s #1 enemy, so if the Israeli Mossad has a chance to set-up Palestine for an international terror attack, they take it. On May 28, 2012, it was reported that Palestinian Airlines was resuming flights after their seven-year hiatus. According to reports, the airline will make two flights per week with just two planes and one hub. The airline will conduct biweekly flights between El Arish, a city on Egypt’s Sinai peninsula adjacent to the border with Gaza, and Marka airbase, located outside Jordan’s capital Amman. Should a 9/11 style terror attack occur, it is possible that the plane would allegedly originate from Palestine, in an attempt to further demonize the Palestinian people. On October 31, 2011, an alternative new source stated that the U.N. could possibly be a false-flag terror target intended to take America and the world to war with Iran. According to the report, the CIA is preparing to destroy the asbestos condemned United Nations building in New York by posing as construction contractors. Just like in the controlled demolition of the World Trade Center Towers on 9/11, the CIA is preparing to place a small tactical nuke in an excavated hole in the center of the U.N. building’s basement. Like the WTC tower, the presence of asbestos has made the renovations of the U.N. headquarters too expensive with initial costs projected at $1.2 billion. The report goes on to state that the US Congress has already financed this false flag attack by providing $2.65 billion to FEMA on September 29, 2011. In August of 2011, the United Nations disclosed that they were a victim of cyber terrorism. The cyber security company McAfee stated that the cyber-attack came from a “state actor” but declined to name it. Eventually, the “state actor” will be outed and chances are the nation of Iran will be implicated. More recently, on August 15, 2012, a bomb has exploded near a fuel truck outside a hotel where U.N. observers were staying in Syria. Although this was not a direct attack on the U.N., it may be an indication that the U.N. will be targeted in the near future. Is the U.N. conveniently being renovated just prior to its scheduled destruction? According to a Press Core report, “Like the World Trade Center Towers the presence of asbestos has made the renovations of the U.N. headquarters too expensive and impractical. The cost to safely remove the asbestos from the ceilings of the building doubled the initial projected cost of $1.2 billion. That is the official revised cost. The actual cost is much higher. Some estimates put it as much as 10 times more expensive. Now that they have discovered that the U.N. pipes are also lined with asbestos the cost to remove and replace all of the piping in the building makes the UN building a perfect site for another CIA false flag attack.” According to Fox News, the U.N. has already used $2 billion and is asking for $3 billion more to finish the remodel, ultimately keeping the U.N. building an open construction site whereby explosives could be easily installed at any time. On April 5, 2011, the U.N. building in New York City served as a staging ground for a massive terror drill with the main focus being on nuclear terrorism. The drill began at the U.N. and then moved to other locations throughout New York City. The week-long series of terror drills involved dozens of agencies and first responders and focused on one of the great concerns of the post-9/11 era: nuclear terrorism. According to report, the NYPD and 70 other law enforcement agencies tested their ability to detect radiological materials and prevent an attack orchestrated by four fictional terror cells intent on targeting New York City with a “dirty bomb”. The hurried U.N. Meeting on Yom Kippur involving a majority of the world’s major leaders stinks, period. The sudden timing of the meeting is so abnormal it begs the question: Why is the United Nations in such a rush to give the world stage to the alleged nuke seeking President of Iran and the alleged terror funding President of Palestine on a Jewish holiday? Could the rising violence in the Middle East combined with the U.N. spectacle on a Jewish holiday be the recipe for new terror attacks in America? If there is any more funny terror business in New York City or America for that matter, intelligent Americans now know that Israel and their Mossad executed the 9/11 attacks and won’t be buying into the Arab/Muslim bogeyman this time around.